Jamie Peterson is gay. He’s known for several years now and frankly, girls ick him out. The problem is, he hasn’t come out to his best friend – and crush – Mason Viveros, the boy he lusts after but is too afraid of damaging their long-time best-friendship. It seems that everyone at school knows or thinks Jamie might be gay, too. FAN ART was an almost sugary-sweet and super-fluffy novel. I think it could have been better served with more issue in the book and less fluff, actually, since LGBTQ issues are front and center in our world right now. 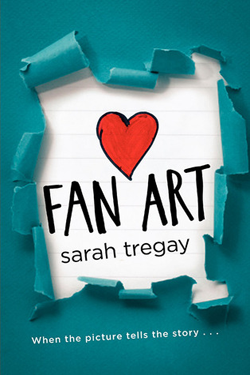 I did really like that this is a YA centered around teen male gay romance, but Sarah Tregay tried a little too hard to with stereotypes: Mason is the typical nerdy boy, Nick is the typical redneck, Eden is the typical art geek, but Jamie isn’t your stereotypical gay teenaged boy? Because he’s…manly? I’ll be honest: I didn’t see a lot of evidence that he was all that manly. And even though we live in 2014 and not, say, 15-20 years ago, I also found it a little hard to accept that Jamie’s classmates (who all seemed to know) were all (or 99% anyway) okay with his being gay. I also have a hard time accepting that a gay boy would kiss a girl simply to “practice”. Believability factor: low. But it was still a nice novel to read. Jamie is trying to come out to Mason, and also advocate for the gay community by publishing fan art in the school magazine, Gumshoe, which is filled with artwork, poetry, and prose submitted by other students. He takes one “for the team” when he sneaks in a graphic short that depicts a gay couple, and thus spirals a series of events that leads to…things. I really enjoyed reading all the poetry and prose and seeing the graphics shorts, submitted by the students between each chapter. So unique! While the plot had holes (as mentioned above), it was okay and still enjoyable. I had suspicions on how it would end (and the ending was too clean for me) because it was too fluffy to end otherwise, but if I’m being completely honest, I was never sure about Mason. I think most people will enjoy FAN ART, especially if you are looking for diverse books to add to your collection. Just don’t expect something that will move your world.